880024 White PU cosmetic bag. Grey marble detail. Rose gold plated hardware. Metal zip closure. Width: 20cm, Height: 12cm, Depth: 6cm. 88981 Black and grey canvas tote bag. Dark beige PU trim. Rhodium plated hardware. Nylon zip closure. Inner and outer pockets including padded pocket to hold 10 inch by 11 inch tablet. Width: 32cm, Height: 37cm, Depth: 13cm. 84836 Antique silver plated necklace. Black genuine leather cord. 66cm. 50mm drop. Denim bomber jacket: Levis at Edgars. Jeans: Levis at Edgars. 80702 Jet plated watch. Tan genuine leather strap. Black dial. Brown hands. Non-functional decorative detail. Closes 18cm to 22cm. 50mm case. 88980 Black and grey canvas travel bag. Dark beige trim. Rhodium plated hardware. Nylon zip closure. Inner and outer pockets. Black webbing shoulder strap. Width: 51cm, Height: 26cm, Depth: 25cm. Dark tortoise shell polycarbonate frame. Gold plated hardware. Gold plated temples. Dark tortoise shell tips. Grey graduating lenses. 140mm width. 89221 XXS XS S M L XL XXL YL ZL Antique silver plated ring. Antique silver plated ring. 15mm width. Denim jacket: Guess at Edgars. T-shirt: Edgars. Black polycarbonate frame. Matching temples and tips. Soft blue lenses. 140mm width. 80704 Jet plated watch. Blue rubber strap. Blue dial. Orange hands. Nonfunctional decorative detail. 85300 Antique silver plated bracelet. Lobster claw clasp. Closes 18cm to 22cm. 50mm case. 21cm extends to 22,5cm. 10mm width. 80710 Jet plated watch. Blue genuine leather strap. White dial. White hands. Non-functional decorative detail. Closes 17cm to 22cm. 45mm case. Antique silver plated necklace. Lobster claw clasp. 66cm. 65mm drop. 85301 Black genuine leather bracelet. Antique silver plated detail. Adjustable. 22cm. 12mm width. UV 400 PROTECTION 83204 Black polycarbonate frame. Gunmetal plated hardware. Matching temples and tips. Grey lenses. 140mm width. 80705 Jet plated watch. Olive green rubber strap. Olive green dial. Orange hands. Non-functional decorative detail. Closes 18cm to 22cm. 50mm case. 85304 Brown genuine leather bracelet. Magnetic clasp closure. Total length 42cm. Bomber jacket: Daniel Hechter at Truworths. Denim jeans J-Exchange at Edgars. 84835 Antique silver plated necklace. 66cm. Lobster claw clasp. 50mm drop. 88975 Army green canvas backpack. Brown PU trim. Bronze plated hardware. Pull string and clip closure. Inner and outer pockets including padded pocket to hold 10 inch by 15 inch laptop. Width: 28cm, Height: 40cm, Depth: 17cm. 85296 Antique silver plated bracelet. Lobster clip closure. 20cm extends to 23cm. 15mm width. 88979 80709 Jet plated watch. Black genuine leather strap. Black dial. White hands. Nonfunctional decorative detail. Closes 17cm to 22cm. 45mm case. Black canvas travel bag. Dark beige PU trim. Rhodium plated hardware. Nylon zip closure. Inner and outer pockets. Black webbing shoulder strap. Width: 51cm, Height: 34cm, Depth: 22cm. 13 Denim bomber: Guess at Edgars. Tshirt: Edgars. Grey jeans J-Exchange at Edgars. 89223 XXS XS S M L XL XXL YL ZL Antique silver plated ring. 6mm width. R249 84838 Antique silver plated necklace. Lobster claw clasp. Antique silver plated necklace. Lobster claw clasp. 66cm. 35mm drop. 85306 Antique silver plated bracelet. Lobster claw clasp. 21cm extends to 22cm. 5mm width. Rhodium plated watch. Black genuine leather strap. Black dial. White hands. Non-functional decorative detail. Closes 18cm to 23cm. 45mm case. 83194 Brown polycarbonate frame. Gold plated temples with red trim. Brown tips. Brown lenses. 140mm width. 89222 XXS XS S M L XL XXL YL ZL Antique silver plated ring. 20mm width. 88977 Light brown and green coated canvas backpack. Chocolate and brown PU trim. Bronze plated hardware. Pull string and magnetic clip closure. Inner and outer pockets including padded pocket to hold 10 inch by 15 inch laptop. Width: 32cm, Height: 43cm, Depth: 13cm. 85295 Black genuine leather bracelet. Antique silver plated chain detail. Press stud closure. Adjustable. 24cm. 32mm width. Rhodium plated watch. Navy genuine leather strap. Blue dial. Silver hands. Non-functional decorative detail. Closes 17cm to 22cm. 40mm case. Grey t-shirt: J-Exchange at Edgars. Jeans: models own. 88974 Grey and black canvas travel bag. Dark beige PU trim. Rhodium plated hardware. Nylon zip closure. Inner and outer pockets. Black webbing shoulder strap. Width: 56cm, Height: 28cm, Depth: 25cm. 85303 Black genuine leather bracelet. Stainless steel detail. Cotton cord closure. Adjustable. 23cm. 83195 Black polycarbonate frame. Matching temples and tips with grey trim. Graduating grey lenses. 140mm width. 85302 Antique silver plated bracelet. Lobster claw clasp. 20cm extends to 21cm. 88978 Army green coated canvas tote bag. Chocolate brown PU trim. Bronze plated hardware. Magnetic clip closure. Inner and outer pockets. Width: 44cm, Height: 38cm, Depth: 15cm. 84840 Antique silver plated necklace. Lobster claw clasp. 66cm. 68mm drop. 85299 Black genuine leather bracelet. Antique silver plated detail. Stud closure. Adjustable. 24cm. 25mm width. 83205 Tortoise shell polycarbonate frame. Gold plated hardware. Matching temples and tips. Grey graduating lenses. 140mm width. 89220 XXS XS S M L XL Antique silver plated ring. Adjustable. 30mm width. 80706 Jet plated watch. Soft brown genuine leather strap. White and rose gold dial. White hands. Non-functional decorative detail. Closes 17cm to 22cm. 45mm case. Antique silver plated necklace. Lobster claw clasp. 66cm. 55mm drop. Bomber jacket: Daniel Hecher at Truworths. T-shirt: Uzzi at Truworths. 88976 Light brown and green canvas travel bag. Chocolate brown PU trim. Bronze plated hardware. Nylon zip closure. Inner and outer pockets. Webbing shoulder strap. Width: 56cm, Height: 28cm, Depth: 25cm. 85305 Antique silver plated bracelet. Lobster claw clasp. 21cm extends to 22cm. 5mm width. Black genuine leather bracelet. Antique silver plated detail. Stud closure. 21cm. 16mm width. 84837 Antique silver plated necklace. Lobster claw clasp. 85297 Black genuine leather bracelet. Antique silver plated detail. Buckle closure. Closes 19,5 to 22,5cm. 12mm width. 89218 XXS XS S M L XL XXL YL ZL Antique silver plated ring. 15mm width. Denim jacket: Levis at Edgars. T-shirt: Uzzi at Truworths. Jeans: models own. 88973 Grey and black canvas back pack. Dark beige PU trim. Rhodium plated hardware. Magnetic clip closure. Inner and outer pockets including padded pocket to hold 10 inch by 15 inch laptop. Webbing handles. Width: 32cm, Height: 48cm, Depth: 7cm. 880000 Tan PU handbag. Gold plated hardware. Nylon zip closure. Protective dust cover. Removable inner bag with nylon zip closure. Interchangeable shoulder strap. Handbag width: 27cm, Height: 29cm, Depth: 14cm. Inner bag: Width: 19cm, Height: 14cm, Depth: 6cm. FREE INNER BAG 84939 Two-tone rhodium and 24ct gold plated necklace. White synthetic pearls. Lobster claw clasp. 79cm extends to 84cm. 45mm drop. 820074 PE 24ct gold plated earrings. Brown tortoise shell resin earrings. 65mm drop. R129 80721 24ct gold plated bangle style watch. White detail. White dial. Gold hands. 60mm inner diameter. Adjustable. 35mm case. 880006 Light tan PU handbag. Gunmetal plated hardware. Nylon zip and flap with magnetic clip closure. Outer pockets. Protective dust cover. Width: 22cm, Height: 17cm, Depth: 7cm. R349 820073 PE Soft purple mottled resin earrings. 50mm drop. 820086 PE 24ct gold plated earrings. Cream mottled resin detail. 820076 PE 24ct gold plated earrings. Brown and cream resin earrings. 880003 Tan PU backpack. Gold plated hardware. Nylon zip and flap with magnetic clip closure. Inner and outer pockets. Protective dust cover. Width: 26cm, Height: 30cm, Depth: 14cm. 880016 Tan faux suede purse. Gold plated hardware. Clip and metal zip closures. Holds notes, coins and cards. Width: 19cm, Height: 9cm, Depth: 3cm. 33 Linen dress: Earth Addict at Truworths White linen shirt: Studio W at Woolworths. Jacket: Woolworths. Denim jeans: J-Exchange at Edgars. 84926 Matt gold plated necklace. Soft beige cotton cord. Faux animal print detail. Adjustable. 80cm. 95mm drop. 24ct gold plated earrings. Faux animal print detail. Tan faux suede handbag. Gold plated hardware. Magnetic clip closure. Outer pockets. Protective dust cover. Removable matching inner pouch with nylon zip. Handbag: Width: 29cm, Height: 31cm, Depth: 12cm. Inner pouch: Width: 25cm, Height: 18cm. 820083 PE 24ct gold plated earrings. White resin detail. 40mm drop. 880004 Tan PU handbag. Gold plated hardware. Magnetic clip closure. Protective dust cover. Removable inner bag with nylon zip closure. Interchangeable shoulder strap. Handbag: width: 27cm, Height: 29cm, Depth: 14cm. Inner bag: Width: 22cm, Height: 19cm, Depth: 6cm. 820080 PE 24ct gold plated earrings. White, grey and brown resin earrings. 820069 PE White and brown mottled resin earrings. 40mm drop. R95 84931 24ct gold plated necklace. Mustard cotton cord and tassel. Lobster claw clasp. 70cm extends to 80cm. 190mm drop. 83193 Transparent grey polycarbonate frame. Black temples and tips. Grey lenses. 140mm width. 88985 Tan PU handbag. Gunmetal plated hardware. Nylon zip and magnetic clip closure. Inner and outer pockets including large central pocket. Adjustable strap. Protective dust cover. Removable inner pouch. Magnetic clip closure. Handbag: Width: 30cm, Height: 31cm, Depth: 13cm. Pouch: Width: 22cm, Height: 14cm. 83202 Tortoise shell polycarbonate frame. Soft pink detail. Gold plated hardware. Brown temples and tips. Graduating purple lenses. 140mm width. Jacket: Rundholtz at Thats It! Pants: Mr Price. 84936 Two-tone rhodium and 24ct gold plated necklace. Black cotton cord. Lobster claw clasp. 45cm extends to 50cm. 25mm drop. 88987 Brown faux suede handbag. Gold plated hardware. Nylon zip closure. Protective dust cover. Removable inner bag with nylon zip closure and shoulder strap. Handbag: Width: 34cm, Height: 29cm, Depth: 13cm. Inner bag: Width: 21cm, Height: 17cm, Depth: 8cm. 820077 PE 24ct gold plated earrings. Shades of brown resin detail. 65mm drop. 83197 Demi brown polycarbonate frame. Matching temples and tips. Grey lenses. 820066 PE 24ct gold plated earrings. Brown resin detail. 70mm drop. 88984 Chocolate brown PU handbag. Gunmetal plated hardware. Nylon zip and magnetic clip closure. Inner and outer pockets including large central pocket. Adjustable strap. Protective dust cover. Removable inner pouch. Magnetic clip closure. Handbag: Width: 30cm, Height: 31cm, Depth: 13cm. Pouch: Width: 22cm, Height: 14cm. 83201 Tortoise shell polycarbonate frame. Gold plated hardware. Matching temples and tips. Grey lenses. 140mm width. 84942 24ct gold plated necklace. Lobster claw clasp. 820051 PE 24ct gold plated earrings. 70mm drop. 51cm extends to 56cm. 20mm drop. 80717 Rose gold pated watch. Olive green dial. Rose gold hands. Olive green PU strap. Closes 16,5cm to 20,5cm. 35mm case. 88992 Tan faux suede handbag. Gold plated hardware. Magnetic clip closure. Protective dust cover. Removable inner bag with nylon zip and shoulder strap. Handbag: Width: 33cm, Height: 31cm, Depth: 14cm. Inner bag: Width: 24cm, Height: 19cm, Depth: 6cm. 80712 Rose gold plated watch. Clear glass crystal detail. White dial. Rose gold hands. Closes 18cm. Fold over clasp. 22mm case. 88991 Beige faux suede handbag. Gold plated hardware. Nylon zip closure. Shoulder strap included. Protective dust cover. Width: 23cm. Height: 22cm, Depth: 10cm. R369 84923 Matt gold plated necklace. Black cotton cord. Lobster claw clasp. 50cm extends to 59cm. 80mm drop. 24ct gold plated bracelet. Beige PU strap. Stud closure. 18cm. 24ct gold plated necklace. Lobster claw clasp. Brown tortoise shell resin earrings. 69cm extends to 74cm. 60mm drop. 820089 PE Soft brown resin earrings. 85mm drop. 820092 PE Black and cream resin earrings. 65mm drop. 24ct gold plated earrings. Clear glass crystal. 24ct gold plated earrings. Green coated disc. 820064 PE 24ct gold plated earrings. Blue resin detail. 820053 PE Matt gold plated earrings. 60mm drop. 85377 24ct gold plated bracelet. Bottle green PU trim. Lobster claw clasp. 18cm extends to 22cm. 40mm width. 85371 Olive green bangle. Semi-adjustable. 60mm inner diameter. 80722 24ct gold plated watch. Matt gold PU strap. Gold dial and hands. Closes 16 to 20cm. 35mm case. 88989 88982 Light tan PU handbag. Olive green faux suede trim. Gold plated hardware. Metal zip closure. Protective dust cover. Removable inner bag with nylon zip closure. Interchangeable shoulder strap. Handbag width: 32cm, Height: 22cm, Depth: 12cm. Inner bag: Width: 20cm, Height: 15cm, Depth: 8cm. Tan faux suede handbag. Gold plated hardware. Nylon zip closure. Shoulder strap included. Protective dust cover. Width: 23cm. Height: 22cm, Depth: 10cm. 51 Lurex trimmed top and trousers: Nicci Boutiques. Shoes: stylists own. Top: Nicci Boutiques. Trousers: Nicc Boutiques. 88990 Olive green faux suede handbag. Gold plated hardware. Nylon zip closure. Shoulder strap included. Protective dust cover. Width: 23cm. Height: 22cm, Depth: 10cm. R369 84925 24ct gold plated necklace. Green coated discs. Green cotton cord. Lobster claw clasp. 43cm extends to 50cm. 100mm drop. 24ct gold plated earrings. Green coated disc. 45mm drop. Mesh top: That’s It! Trousers: That’s It! 88993 Olive green faux suede handbag. Gold plated hardware. Magnetic clip closure. Protective dust cover. Removable inner bag with nylon zip and shoulder strap. Handbag: Width: 33cm, Height: 31cm, Depth: 14cm. Inner bag: Width: 24cm, Height: 19cm, Depth: 6cm. 84933 Rhodium plated necklace. Lobster claw clasp. 69cm extends to 74cm. 60mm drop. 880011 Khaki faux suede purse. Gunmetal plated hardware. Clip and metal zip closure. Holds notes, coins and cards. Width: 20cm, Height: 10cm, Depth: 1,5cm. 820054 PE 880018 Army green faux suede purse. Gunmetal plated hardware. Clip closure. Holds notes, coins and cards. Width: 20cm, Height: 10cm, Depth: 3cm. Matt rhodium plated earrings. 60mm drop. 880005 Olive green PU handbag. Gold plated hardware. Magnetic clip closure. Protective dust cover. Removable inner bag with nylon zip closure. Interchangeable shoulder strap. Handbag: width: 27cm, Height: 29cm, Depth: 14cm. Inner bag: Width: 22cm, Height: 19cm, Depth: 6cm. 85373 24ct gold plated bracelet. Bottle green cotton cord. Bottle green PU trim. Lobster claw clasp. 18cm extends to 22cm. 40mm width. R189 84940 24ct gold plated necklace. Lobster claw clasp. 80cm extends to 85cm. R295 820091 PE Dark green resin earrings. 60mm drop. 880008 Dark mint green PU handbag. Gunmetal plated hardware. Nylon zip closure. Flap with magnetic clip closure. Outer pockets. Protective dust cover. Width: 22cm, Height: 17cm, Depth: 7cm. 820088 PE Soft green resin earrings. 85mm drop. 820085 PE 24ct gold plated earrings. Mottled resin bead. 40mm drop. R95 820043 PE 24ct gold plated earrings. Olive and mint green detail. 75mm drop. 820058 PE 24ct gold plated earrings. Turquoise and black synthetic stones. 70mm drop. 820062 PE Mint green mottled resin earrings. 50mm drop. 880002 Black PU backpack. Gold plated hardware. Nylon zip and flap with magnetic clip closure. Inner and outer pockets. Protective dust cover. Width: 26cm, Height: 30cm, Depth: 14cm. 820049 PE 24ct gold plated earrings. Clear and black glass crystal. Black cotton tassel. 170mm drop. 85362 24ct gold plated bangle. Black PU detail. Semi-adjustable. 820096 PE 24ct gold plated earrings. Black PU detail. 83198 Black polycarbonate frame. Matching temples and tips. Gold plated hardware. Pink revo lenses. 140mm width. 84927 24ct gold plated necklace. Black PU detail. Black wax cord. Lobster claw clasp. 82cm extends to 92cm. 80mm drop. Kimono top: Studio W at Woolworths. Wide-legged trousers: Countryroad at Woolworths. 84938 24ct gold plated necklace. Black cotton cord. Lobster claw clasp. 42cm extends to 48cm. 50mm drop. 88986 Black PU handbag. Gunmetal plated hardware. Nylon zip and magnetic clip closure. Inner and outer pockets including large centre pocket. Adjustable strap. Protective dust cover. Removable inner pouch. Magnetic clip closure. Handbag: Width: 30cm, Height: 31cm, Depth: 13cm. Pouch: Width: 22cm, Height: 14cm. 24ct gold plated bracelet. Black PU strap. Stud closure. 83200 Black polycarbonate frame. Gold plated temples and trim. Black tips. Soft purple graduating lenses. 140mm width. 820093 PE 24ct gold plated earrings. Black resin detail. 70mm drop. 84944 24ct gold plated necklace. Lobster claw clasp. 73cm extends to 82cm. 45mm drop. 880009 Black PU purse. Gunmetal plated hardware. Clip closure. Holds notes, coins and cards. Width: 19cm, Height: 9cm, Depth: 3cm. 85369 24ct gold plated bracelet. Black faux suede. Pull through closure. 18cm. 820045 PE 24ct gold plated earrings. Matt finish. Black tassel. 95mm drop. 83199 Black polycarbonate frame. Gold plated temples. Black tips. Grey graduating lenses with silver revo finish. 145mm width. 84937 Rhodium, jet and 24ct gold plated necklace. Black cotton cord. Lobster claw clasp. 45cm extends to 50cm. 35mm drop. 85363 24ct gold plated bracelet. Gold cotton rope. Lobster claw clasp. 19cm extends to 24cm. R189 820042 PE 24ct gold plated earrings. Black detail. 75mm drop. 83203 Brown polycarbonate frame. Soft peach and topaz synthetic crystal. Matching temples and tips. Brown lenses. 145mm width. 820101 PE 24ct gold plated earrings. Gold rope detail. 95mm drop. 820056 PE 24ct gold plated earrings. Black resin detail. 40mm drop. 84934 Two-tone rhodium and 24ct gold plated necklace. Black cotton cord. Lobster claw clasp. 42cm extends to 47cm. 85m drop. 88999 Black PU handbag. Mustard PU trim. Gunmetal plated hardware. Nylon zip closure. Protective dust cover. Black PU removable inner bag with nylon zip closure and shoulder strap. Handbag: Width: 40cm, Height: 28cm, Depth: 10cm. Inner bag: Width: 19cm, Height: 13cm, Depth: 8cm. 820098 PE 24ct gold plated earrings. Yellow PU detail. 90mm drop. R229 820059 PE 24ct gold plated earrings. Amber resin disc. 70mm drop. 85374 24ct gold plated bracelet. Mustard cotton cord. Mustard PU trim. Lobster claw clasp. 18cm extends to 22cm. 40mm width. 24ct gold plated earrings. Yellow PU detail. 24ct gold plated earrings. Yellow and white resin detail. 880020 Mustard PU purse. Gunmetal plated hardware. Clip closure. Holds notes, coins and cards. Width: 19cm, Height: 9cm, Depth: 3cm. 880019 Mustard PU handbag. Black PU trim. Gunmetal plated hardware. Nylon zip closure. Protective dust cover. Mustard PU removable inner bag with nylon zip closure and shoulder strap. Handbag: Width: 40cm, Height: 28cm, Depth: 10cm. Inner bag: Width: 19cm, Height: 13cm, Depth: 8cm. 820067 PE 24ct gold plated earrings. Black and white resin detail. 50mm drop. R169 84920 24ct gold plated necklace. Black wax cord. White resin detail. Adjustable. Lobster claw clasp. 65cm extends to 75cm. 190mm drop. 880014 Black PU purse. Gunmetal plated hardware. Clip and metal zip closure. Holds notes, coins and cards. Width: 20cm, Height: 10cm, Depth: 2,5cm. 88994 Burgundy PU handbag. Gunmetal plated hardware. Nylon zip closure. Inner and outer pockets. Matching shoulder strap. Protective dust cover. Width: 33cm, Height: 22cm, Depth: 11cm. R569 84928 Rhodium plated necklace. Burgundy PU detail. Lobster claw clasp. 98cm extends to 108cm. 90mm drop. 820075 PE 24ct gold plated earrings. Dark red resin detail. 60mm drop. 85368 24ct gold plated bracelet. Burgundy faux suede. Pull through closure. 18cm. 880010 Burgundy PU purse. Gunmetal plated hardware. Clip closure. Holds notes, coins and cards. Width: 19cm, Height: 9cm, Depth: 3cm. 820063 PE 24ct gold plated earrings. Burgundy resin detail. 70mm drop. 820044 PE 24ct gold plated earrings. Matt finish. Burgundy tassel. 95mm drop. 84930 24ct gold plated necklace. Burgundy cotton cord and tassel. Lobster claw clasp. 70cm extends to 80cm. 190mm drop. 820099 PE 24ct gold plated earrings. Burgundy PU detail. 60mm drop. Rhodium plated bracelet. Burgundy PU. Stud closure. 18cm. 85370 Burgundy bangle. Semi-adjustable. 60mm inner diameter. 24ct gold plated bracelet. Burgundy cotton cord. Burgundy PU trim. Lobster claw clasp. 18cm extends to 22cm. 40mm width. 85375 24ct gold plated bracelet. Burgundy PU trim. Lobster claw clasp. 18cm extends to 22cm. 40mm width. 83191 Demi red polycarbonate frame. Matching temples and tips. Grey lenses. 145mm width. 820097 PE 24ct gold plated earrings. Burgundy PU detail. 90mm drop. 85364 24ct gold plated bracelet. Burgundy cotton rope. Lobster claw clasp. 19cm extends to 24cm. 80720 24ct gold plated bangle style watch. Maroon detail. Maroon dial. Gold hands. 60mm inner diameter. Adjustable. 35mm case. 24ct gold plated earrings. Burgundy and brown resin earrings. 55mm drop. 820068 PE Multi-colour red and blue resin earrings. 45mm diameter. 88988 Navy faux suede handbag. Gold plated hardware. Nylon zip closure. Protective dust cover. Removable inner bag with nylon zip closure and shoulder strap. Handbag: Width: 34cm, Height: 29cm, Depth: 13cm. Inner bag: Width: 21cm, Height: 17cm, Depth: 8cm. 85367 Rhodium plated bracelet. Navy PU. Stud closure. 18cm. Black and blue resin earrings. 85mm drop. 84922 24ct gold plated necklace. Blue cotton rope. Lobster claw clasp. 52cm extends to 62cm. 90mm drop. 85376 24ct gold plated bracelet. Navy PU trim. Lobster claw clasp. 18cm extends to 22cm. 40mm width. 80711 24ct gold plated watch. Clear glass crystal detail. Black dial. Gold hands. Closes18cm. Fold over clasp. 22mm case. 820060 PE 24ct gold plated earrings. Blue resin disc. 70mm drop. 880001 Navy PU handbag. Gold plated hardware. Nylon zip closure. Protective dust cover. Removable inner bag with nylon zip closure. Interchangeable shoulder strap. Handbag width: 27cm, Height: 29cm, Depth: 14cm. Inner bag: Width: 19cm, Height: 14cm, Depth: 6cm. 88997 Navy faux suede handbag. Gold plated hardware. Magnetic clip closure. Outer pockets. Protective dust cover. Removable matching inner pouch with nylon zip. Handbag: Width: 29cm, Height: 31cm, Depth: 12cm. Inner pouch: Width: 25cm, Height: 18cm. Rhodium plated necklace. Navy PU detail. Lobster claw clasp. 98cm extends to 108cm. 90mm drop. 820071 PE Blue mottled resin earrings. 50mm drop. 820102 PE Rhodium plated earrings. Blue rope detail. 95mm drop. R249 85365 Rhodium plated bracelet. Blue cotton rope. Lobster claw clasp. 19cm extends to 24cm. R189 880015 Navy faux suede purse. Gold plated hardware. Clip and metal zip closures. Holds notes, coins and cards. Width: 19cm, Height: 9cm, Depth: 3cm. 80716 Jet plated watch. Black dial. Glitter detail. Rose gold hands. Mesh strap. Magnetic closure. 25cm adjustable. 880007 Black PU handbag. Gunmetal plated hardware. Nylon zip closure. Flap with magnetic clip closure. Outer pockets. Protective dust cover. Width: 22cm, Height: 17cm, Depth: 7cm. 84924 Matt gunmetal plated necklace. Black cotton cord. Lobster claw clasp. 50cm extends to 59cm. 80mm drop. 84941 Two-tone rhodium and jet plated necklace. Black cotton cord. Lobster claw clasp. 44cm extends to 50cm. 75mm drop. R229 84943 84919 Rhodium plated necklace. Black wax cord. Black resin detail. Adjustable. Lobster claw clasp. 65cm extends to 75cm. 90mm drop. Rhodium plated necklace. Lobster claw clasp. 51cm extends to 56cm. 20mm drop. 99 Strappy vest: Woolworths. Linen trousers: Lunar Linen cami: Countryroad Road. Linen trousers: Earth Addict at Truworths. 820065 PE 24ct gold plated earrings. White resin detail. 70mm drop. 820072 PE Black mottled resin earrings. 50mm drop. 83196 Black polycarbonate frame. Matching temples and tips. Grey lenses. 145mm width. 88995 Black PU handbag. Gunmetal plated hardware. Nylon zip closure. Inner and outer pockets. Matching shoulder strap. Protective dust cover. Width: 33cm, Height: 22cm, Depth: 11cm. 820048 PE 24ct gold plated earrings. Clear and black glass crystal. Grey cotton tassel. 170mm drop. 85379 Matt rhodium and gunmetal plated bangle. Spring closure. 60mm inner diameter. 40mm width. R269 820052 PE Rhodium plated earrings. 70mm drop. 820087 PE 24ct gold plated earrings. Grey mottled resin detail. 65mm drop. R129 85338 Rhodium plated bracelet. Soft grey PU strap. Stud closure. 18cm. 84921 Rhodium plated necklace. Silver cotton rope. Lobster claw clasp. 52cm extends to 62cm. 90mm drop. Top: Rundholtz at Thatâ&#x20AC;&#x2122;s It! 80719 Matt rose gold plated watch. Rose gold plated mesh strap. Rose gold dial and hands. Closes 16cm to 21cm. 35mm case. 820078 PE 24ct gold plated earrings. Grey resin detail. 40mm drop. 820094 PE Rhodium plated earrings. Grey synthetic pearls. Rhodium plated watch. Charm detail. White dial. Silver hands. Closes 18cm to 20cm. Fold over clasp. 22mm case. 80718 Rose gold plated watch. Clear glass crystal detail. Pink dial. Rose gold hands. Pink PU strap. 820041 PE 24ct gold plated earrings. Dusty pink detail. 83192 Demi pink polycarbonate frame. Matching temples and tips. Pink lenses. 145mm width. 880012 Dusty pink PU purse. Gunmetal plated hardware. Clip and metal zip closure. Holds notes, coins and cards. Width: 20cm, Height: 10cm, Depth: 1,5cm. 820070 PE Blue mottled resin earrings. 40mm drop. 880013 Dusty pink PU purse. Gunmetal plated hardware. Clip and metal zip closure. Holds notes, coins and cards. Width: 20cm, Height: 10cm, Depth: 2,5cm. 820057 PE 24ct gold plated earrings. Soft blue resin detail. 40mm drop. 80723 Rose gold and jet plated watch. Rose gold dial. Black hands. 88998 Dusty pink PU handbag. Tan PU trim. Gunmetal plated hardware. Nylon zip closure. Protective dust cover. Tan PU removable inner bag with nylon zip closure and shoulder strap. Handbag: Width: 40cm, Height: 28cm, Depth: 10cm. Inner bag: Width: 19cm, Height: 13cm, Depth: 8cm. 80714 Rose gold plated watch. Clear glass crystal detail. Silver dial. Rose gold hands. Non-functional decorative detail. Closes 19cm. Fold over clasp. 38mm case. 24ct gold plated earrings. Green and brown resin earrings. Matt rose gold plated necklace. Turquoise mottled detail. Lobster claw clasp. 820082 PE 24ct gold plated earrings. Soft pink and brown resin earrings. 55mm drop. R129 880017 Dusty pink PU purse. Gunmetal plated hardware. Clip closure. Holds notes, coins and cards. Width: 20cm, Height: 10cm, Depth: 3cm. 88983 Burgundy PU handbag. Light burgundy faux suede trim. Gold plated hardware. Metal zip closure. Protective dust cover. Removable inner bag with nylon zip closure. Interchangeable shoulder strap. Handbag: Width: 32cm, Height: 22cm, Depth: 12cm. Inner bag: Width: 20cm, Height: 15cm, Depth: 8cm. 81120 RED Long lasting with easy application and luxurious coverage, this colour will take you from girl to goddess. Perfect nails need the perfect finish. Get that glow and shine with this super resilient and plumping clear coat. 8ml. R79 81123 PINK Pink never disappoints! With incredible coverage and resilince, this one isnâ&#x20AC;&#x2122;t just for little girls. 8ml. 81122 CORAL A classic colour for any season, this colour is for those soft and feminine mood days. 8ml. A juicy colour with excellent shine, this long lasting hue will give you stand out statement nails. 8ml. Effortless eyes and Luxury lashes 81118 Black conditioning mascara that gives classic length and volume. R179 81119 A classic, retractable black eyeliner that gives a smudge resistant, creamy texture. 14cm lead and 3mm diameter. 81131 Brown eyebrow defining pencil with a long lasting soft texture. Great for all skin tones. 14cm. 81117 Black conditioning mascara that gives intense volume and curl. Plum so soft and yum, your lips will become the appetiser. 6ml. Gives a subtle but beautiful sheen that highlights your gorgeous lips. 81125 RED Slick on this creamy crimson hue to get some va va voom. 6ml. Perfume Noun A fragrant liquid made from essential oils extracted from flowers and spices, used to give a pleasant scent to oneâ&#x20AC;&#x2122;s body. Eau de Parfum All our fragrances are classified as Eau de Parfum (EdP). Honey EdPâ&#x20AC;&#x2122;s may last for 8 hours or more. Sixteen beautiful fragrances for men and women. All Honey Eau de Parfums contain above 20% concentrate of pure essential oils. As a VIP Client you will receive our promotions and specials, as and when they launch, giving you the opportunity to place your orders early. Client Signature	I hereby subscribe to the Honey VIP Client Programme. I would like to received Honey news and promotions and “be first to know”. I would like to join Honey as a Sales Consultant, please contact me. Visit the website at www.honeyacc.co.za and complete the VIP pop up icon to join! Alternatively, complete this form and hand it to your Honey representative. Account Number	As a VIP Client all the above information needs to be completed in full. All information will be kept confidential. We offer amazing promotions in addition to our catalogues. FINANCIAL FREEDOM? We are inviting vibrant and entrepreneural women and men to join our Honey Family. You can start today! YOUR BUSINESS YOUR STYLE As a Style Station you can then become a Team Leader and earn up to 24% discount on your team sales and 44% on your own sales. Please answer the following questions Do you have your own transport? Do you have acess to internet and email daily? Do you have a Whatâ&#x20AC;&#x2122;sApp enabled smart phone? Male ring sizing Place your own ring over these circles to determine your finger size. NOTE: There are no in between sizes other than those indicated in the Honey catalogues. Quality products need quality care Honey Ear Care (50ml) 41077 Specially formulated to keep pierced ears clinically clean and fresh! Avoid possible irritation and infection from prolonged use of pierced earrings. R25 SPECIAL TIP You may like to wipe down the post of your earring in the same manner as described for cleaning your earlobe. Honey Jewellery Cleaner (100ml) 41076 Take good care of your fashion jewellery the Honey way! Our jewellery cleaner does not contain detergent or any other harmful chemicals, so it is safe to use on your Honey jewellery. R25 SPECIAL TIP Store your jewellery in a dry environment and enjoy a long relationship with your special accessories. Honey Quality Guarantee Honey Fashion Accessories believes in allergy-safe products, thus ensuring the well -being of sensitive skin. Honey jewellery is expertly electro-plated with precious metals to ensure we can provide you with an enduring high-quality product. All plating and base metals are nickel free and in most cases lead-free and cadmium free. Pierced earrings come with a clutch stabiliser for comfort and security. Clip earrings feature comfortable clips • Neckware and bracelet lengths as stated in this catalogue include the clasp in the measurements, and may vary slightly between 0,5 and 1cm • Most of our neckware includes an extender – additional extenders may be available to purchase. Honey handbags can be cleaned with a soft damp cloth and dried immediately. Detergents should not be used. QUALITY GUARANTEE: We believe so emphatically in our product, that we accept full responsibility for quality. In terms of our guarantee*, Honey will replace any item that manifests any defect in material or workmanship within the quality care guarantee period. Please visit our website for our full Quality Guarantee. All Honey timepieces are guaranteed for one year from defect of mechanism or workmanship under normal use. Honey watches all contain “Japanese Movement Technology and batteries”. Water resistant for hand wash. Pierced earrings are not returnable for hygiene reasons. This promotion runs while stocks last. Collection launches 8 April 2019. Prices in this collection are valid for the duration of this promotion only. Products featured in this collection, in some instances, may not be life-size. All Honey handbags are made from quality PU (polyurethane) leather. PU is recyclable. PU leather is a split leather, that has been overlaid with a polyurethane (PU) coating and is generally more durable than other material. Linen cami: Countryroad at Woolworths; linen trousers: Earth Addict at Truworths.Shirt dress; Earth Addict at Truworths. White linen shirt: Studio w at Woolworths. Denim jeans: j-Exchange at Edgars. 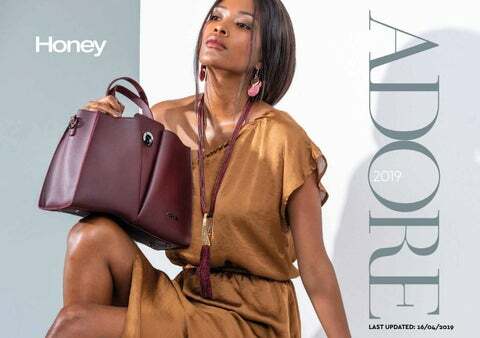 Linen dress: Earth Addict at Truworths.